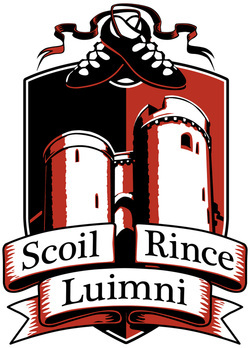 ​Scoil Rince Luimni ("Limerick School of Dance" in Irish) was established in 2014 by Courtney Jay TCRG. After spending four years studying at the University of Limerick (Ireland), Courtney decided to name the academy after her Irish home. SRL offers quality instruction in a professional and supportive environment. Our community of families helps newcomers feel included and welcomed both in and out of the studio. SRL creates dancers who are strong in technique, passionate about their dancing, and driven to achieve their goals through dedicated staff and structured classes. We guide & nurture your dancer down the path that is right for them - whether it is as a recreational dancer, participating in casual performances, or pursuing the competitive track. Courtney Jay has been dancing for 20 years. She trained for 12 years under Sheila Stevens and she found her love for Irish dancing and passion for teaching. Courtney decided to attend college at the University of Limerick where she earned her BA Irish Music and Dance with first class honors. While in Ireland she studied under the Fleming-Ball School of Irish Dance where she became Munster Champion in both solos and teams, an All-Ireland, Great Britain, All-Scotland and World Championship medalist, and top 10 finisher at the North American and All-Ireland championships. Courtney has passed the rigorous certification process that allows students to compete worldwide in Irish dancing through An Coimisiun le Rinci Gaelacha and now gives workshops in championship choreography and training around North America. Courtney has been teaching and coaching dancers since she was 13 years old. Helping each child become the best dancer they can be has been a rewarding experience for her. For Courtney, Irish dancing has always gone beyond steps and technique; Irish dancing helped her grow as a person and in character. She hopes her students learn to love dancing, make life-long friends, and strengthen their character during their time at SRL. Join us and become a part of our vibrant academy to learn, perform, or compete in Irish dancing! Irish dance had humble beginnings as a folk dance and as a means of expression of national identity for Ireland. Throughout the 17th and early 18th centuries, Irish dancing was taught at the crossroads in towns and villages of Ireland by traveling dance masters. The dance masters would travel from town to town teaching dancing steps and technique along with deportment and social graces. By the late 18th century Irish dancing became more formalized with traveling dance masters establishing schools and classes in a fixed location. In 1893, the Gaelic League was established in Dublin. The Gaelic League sought to promote Irish nationalism through their native Irish arts (dance, music, song, language, and sport). Ireland wanted to create it’s own national identity that was distinct from British identity. The Gaelic League enhanced the demand for Irish dancing classes, competitions, and performance and its work is still evident today. The Gaelic League became the governing body over Irish dance and still exists today as An Coimisiun le Rinci Gaelacha, the world’s largest and most global organization of Irish dancers and teachers. Today Irish dancing in its competitive form has evolved into a highly athletic and very technical artistic sport. It is enjoyed by people of all ages, backgrounds, and ethnicities so I invite you to give it a try at SRL! Christian Cairone TCRG has been Irish dancing since he was 3 years old. He trained under Irene and Maureen Horgan who helped instill the love and passion for dancing he has today. While there, he assisted teaching with all levels of classes which helped to increase his love of dancing and teaching. Kelly Beyus started Irish dancing as an adult and quickly developed a love and passion for the sport. While she pursues her competitive goals, Kelly works with our youngest little stars as they take their first steps in Irish dance. As a kindergarten teacher by day, Kelly's patience, enthusiasm, and love of dance transfers directly to her students' work in their dance classes. In her spare time, Kelly enjoys writing and is a published author!